The parallax propeller microprocessor is very versatile. It holds all functions needed to control electrical systems. It is a one card microcomputer. The only circumjacent components needed is power supply via voltage stabilisation and eventually one crystal if there is demand of an exact clock frequency. Proto board with a few components added. The four resistors in group makes a voltage ladder performing a composite video signal. Unbelievable? – but true! The parallax propeller is able to generate video signals. Click on picture for higher resolution! 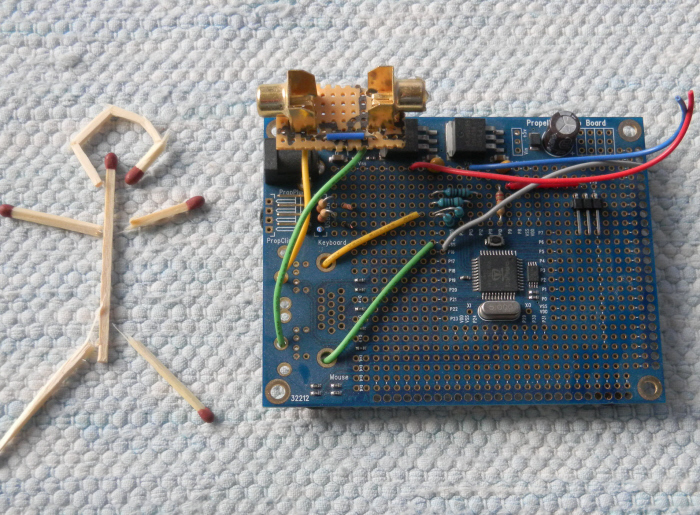 The propeller can be purchased readily mounted on an experimental card (proto-board) with voltage stabilisation and crystal. The card has a nice size 3X4 inch. (77.5X101.6mm). There is lots of space for your own components adding to it in a 0,1 inch hole matrix (2,54mm). This is the common spacing between legs of many components in ordinary packages such as AD-converters in DIL package for example. The microprocessor is not very sensitive to electrical discharge why it can be handled with normal care without damage. The propeller package holds 8 parallel processors connected to each other by a simple control stack. Each processor have strong 32 bit and up to 80MHz capability. Each processor can perform its own job without interference from what’s going on in the other ones. And there is one more very important benefit. There is an Parallax forum where users can share code. This means that you can down load great pieces of code, mix with others and ad your own. This way your programming work will be more fun, efficient and of higher quality. There is also a library with code both from the manufacturer and from other persons with comments and rating.